Somaliland is seeking to build economics and educational ties with Ireland. In recent months, [Abdillahi M] Duale, [the foreign minister of Somaliland,] has been on an international mission to forge ties and set out the case for the recognition of Somaliland. He has visited London, Paris and Washington, where he was treated to full diplomatic protection, a rarity for a representative of an entity that has not been recognised. Last week [September 2008], he met a number of Irish academics and senior business people. ‘‘I want to build ties with Ireland and create links between our two countries,” he said. Somaliland, which has an abundance of oil resources, has already started to create business links with Ireland. The territory recently signed a deal with oil company Enex, and the resulting joint venture partnership, Enex Somaliland, has its holding company incorporated in Ireland. Duale now believes that there are opportunities for other link-ups between Somaliland and Ireland. ‘‘We are particularly interested in your educational model and the success of the Irish economy,” he said. Somaliland has been one of the success stories of African democracy. In 1991, as Somalia’s government disintegrated and the country spiralled into war, Somaliland, traditionally one of the poorest parts of Somalia, declared its independence. 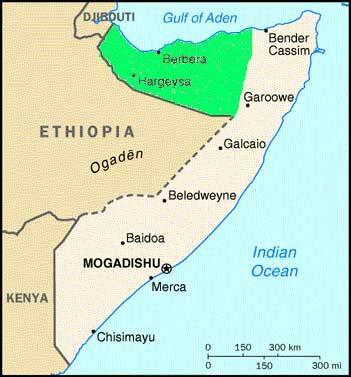 The area had previously been a British protectorate, while the rest of the Somalia was controlled by Italy. The former British area decided it wanted control of its own affairs, and went its separate way. Its leaders have since established a democracy so secure that the United States is considering backing Somaliland ahead of the more volatile Somalia. The territory has held three rounds of multi-party elections, demobilised thousands of young gunmen and moulded them into a functioning army. ‘‘We have a stable democracy. We have shown failed states in Africa that they too can achieve peace and democracy. We have three political parties and we have checks and balances on our political system. Our parliament is very nosey and that is a good thing,” said Duale. Somaliland has designed a political system that minimises clan rivalries by carving out a special role for clan elders, the traditional pillars of Somali society. The country is predominantly Muslim, but operates on a largely secular model. A big sticking point remains the refusal of the African Union formally to recognise Somaliland. Pending a change in that view, Duale will continue to create links with foreign countries, including Ireland, and to further his country’s cause.